We have finally arrived at our home for the next 12 months in the Marina di Stabia – the largest marina in the Med apparently. Room for 685 boats, it is not yet full but quite stylish with a yacht club, a swimming pool, laundrette and showers that work! It is also in a beautiful location under the majestic Mount Vesuvius. We went into town last night to find somewhere to eat and did so but only after 90 minutes of searching! The marina is situated on the outskirts of town in a fairly derelict part of town that would have been redeveloped if the recession hadn’t hit. By accident we found a good but quirky restaurant that was family run with good food and cheap local wine – perfect! Today, Liz and I prepared for our new guests by finding the local supermarket whilst Jase and Lee went to Pompeii for the day. It’s only a 40 minute walk away so it seemed daft not to go there on their last day. We said goodbye to them this evening and we are very grateful for helping us to safely move Nimmie from Alghero to Naples. We have now greeted our new guests, Ingrid and Jan Olav – Liz’s cousins, from Norway who had a convoluted journey via Amsterdam and Milan to get here! We look forward to planning our next week’s itinerary over dinner tonight at the yacht club. 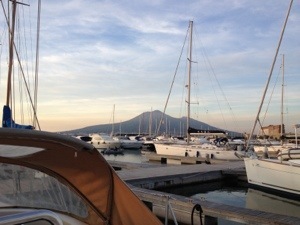 Pictures below of the marina with Vesuvius in the background.